A student at Little Missionary's Day Nursery in the East Village. EAST VILLAGE — Little Missionary's Day Nursery is about to get a lot bigger. The nonprofit preschool is set to double in size to 100 students by September — and school leaders are raising money now to fund the expansion. 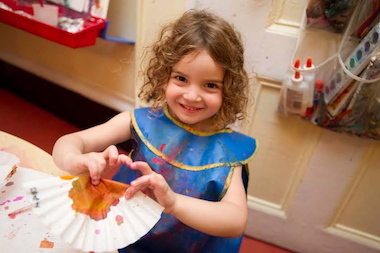 Little Missionary's, which has served the East Village's working families for more than a century, recently launched a $20,000 fundraising campaign to grow the nursery to fill the four-story building the school owns on St. Mark's Place between First Avenue and Avenue A. "We are really bothered by the problem that people really loved what we were doing and we had to turn them away," said Eileen Johnson, the nursery's director since 2001. "For the past six to eight years we have been experiencing a huge demand." Last year the school, which offers programs for 2-to-4-year-olds, turned away 100 applicants, she said. The school currently occupies the building's basement and ground floor, with the upper three floors rented out to another business. The nursery plans to add teaching space on the second and third floors and an office on the fourth floor. Little Missionary's launched the Indiegogo fundraising campaign last week to add to the $50,000 the school has already raised. Supporters who donate can get anything from a T-shirt for a $75 gift to their name engraved on a step for a $5,000 gift. The funds will help reinforce the building's staircase and cover the salary and benefits for the nine new staff members Johnson plans to hire. Johnson has been hoping to expand since 2006, but the organization was still relying on income from its tenant on the top floors. "Now we are in a stable condition," Johnson said. When she took over the school, it was in danger of closing with only eight students enrolled. But Johnson increased parent involvement and refocused the school on its mission of offering affordable childcare for working families. Last year, the nursery offered $20,000 in financial support to families in need and Johnson wants that number doubled in 2014. The regular price for a five-day week at the school is $1,600 per month. Sara Curry — named the "Little Missionary" for her short stature — founded the school in 1896 and cared for hundreds of East Village children while their parents worked in factories. Johnson said that despite the East Village's newer affluent residents, working families in the neighborhood still need help. "People think, 'Oh you know, people have it much better now,' but they forget how high the cost of living is," Johnson said. "There is money coming in," she said, "but there is a lot of money going out."